As of this month, Ontario retirement homes and retirement communities will begin operating under licenses for the first time. The Ontario Retirement Homes Regulatory Authority now requires all retirement homes in Ontario to apply for a licence by July 3. Ontario retirement communities with retirement homes – which are residential complexes or part of a complex, occupied primarily by people 65 years of age or older and providing at least two care services to residents – will need to provide such detailed information as the owners’ personal and financial history, presence of automatic water sprinklers in suites, staff training programs, and experience with patient-care demands. Laurie Johnston, CEO of the Ontario Retirement Communities Association (ORCA), told the Toronto Star that she believes the Ontario Retirement Homes Authority will help raise standards even more than the already high level set in most Ontario retirement communities. “The whole purpose is to raise the bar in the sector,” she said. 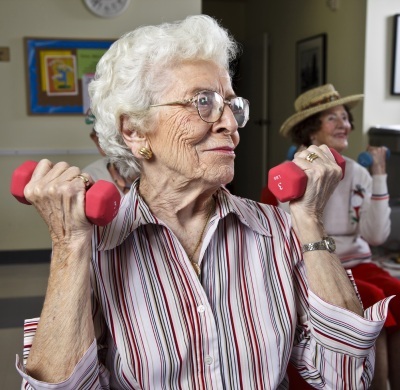 ORCA has set its own standards for resident care, emergency planning and food and meal services its members: about 80 percent of the retirement communities and retirement homes in Ontario. The new requirements include posting a “residents’ bill of rights”, which includes the right to know what care services are provided and what they cost; the right to choice of care services by qualified and trained staff or by external care providers; the right to respect for lifestyle choices; and the right to participate fully in making care decisions and develop the plan of care; among other rights. Additional Ontario retirement home regulations will be phased in through next year, and by the beginning of 2014, the Ontario Retirement Homes Regulatory Authority will be able to hold retirement homes accountable for a full range of practices. Now that Liz Smith’s family is older, she’s “taking the time to do things for myself.” And that includes acting, something she hadn’t done since her high school days, she told Greg Brown in The Meaford Independent. Liz took to the stage at Meaford Hall as Dr. Charlotte in the Meaford Community Theatre production of Marvin’s Room last month. Retirement provides a perfect opportunity to jump into activities you’ve never had the time for in the past. And we just know a lot of soon-to-be-retirees are harbouring a secret desire for the limelight. With the Meaford Community Theatre and a number of other active theatre groups in the area, formerly shy actors can break out of the dressing room and hit the stage. To learn more about Meaford Community Theatre and opportunities to audition or apply for behind-the-scenes roles, call Joanne McKenzie at 519-538-9160 or Greg Brown at 519-538-0517. And if you’re eager to see a small-town community theatre group in action, you don’t need to wait long. In two weeks, Thornbury Community Theatre presents the comedy-thriller A Tomb With a View at the Marsh Street Centre in Clarksburg. Tickets for the performances running May 3 through May 6 are $10 in advance at Thornbury PharmaSave, Stuff to Read in Meaford and The Crow’s Nest book store in Collingwood. Even tiny Rocklyn, just up the Niagara Escarpment from Meaford, has its own community theatre. Rocklyn Country Theatre put on four shows of Seniors of the Sahara last week to rave reviews. After the jazz appetizers of Friday night, you might still have an appetite for the three-course musical menu on Saturday. It starts with the Big Band Era on Saturday afternoon at the Beaver Valley Community Centre, featuring the Georgian Sound Big Band, the Lighthouse Swing Band, and the Toronto All Star Band playing jazz, swing and current “standards”. And a bevy of swing dancers will inspire you to try out some new old moves. Or… as dusk falls, get ready for Dawn – Dawn Tyler Watson, that is – at the Westin Trillium at the Village at Blue Mountain. 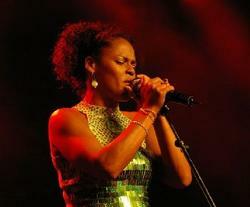 Dawn has won Best Female Artist at the Quebec Lys Blues Awards six times in a row, and took home the 2009 Album of the Year honours. Don’t worry, you can sleep in Sunday morning. The musical brunch at the Golf Club at Lora Bay doesn’t begin till 10:30, and the gospel/spiritual music at St. Georges Parish Hall starts at 2 p.m.
Lora Bay’s popular 5-course brunch features the Dixieland style of the Regal Jazz Band, and the afternoon performance introduces gospel singer Dave Randall and a group of young spiritual singers, Chaverim. In the Southern Georgian Bay area, April showers bring jazz in the wee hours… and in the afternoon… and at brunch. Just down the road, in Thornbury and Clarksburg and at Lora Bay, you can fill just about every waking moment from Friday to Sunday during Jazzmania listening to jazz, big bands, swing, gospel – and even rock ‘n’ roll. This popular event brings in bands from far and near, featuring prominent local acts, high school jazz ensembles from the surrounding area, and well-known performers from Ontario and outside the province. This festival brings fresh meaning to the cliché, “a feast for the ears”; in fact it’s a veritable smorgasbord. The Jazz Youth Invitational kicks things off early on Friday, with student ensembles performing before jazz professionals and getting feedback and commentary, followed by a performance by the Noodle Factory Jazz Project. You can drop in any time. The Music Crawl has always been a popular way to sample sounds from a variety of acts, in a variety of venues on Friday night… but before you start your jazz journey, consider this year’s new Dinner Jazz feature. Choose by venue or choose by band, but be prepared to enjoy great food and music in one of the area’s fine eateries. Here’s who’s on where. After dinner, get ready to “crawl” with jazz and blues at a number of “hot spots” open until nigh on midnight. That’s just the first day. Rest up for a full day Saturday, and the popular Jazz Brunch at Lora Bay on Sunday. More tomorrow. The skiers were still on the hills when Meaford Golf Club opened for play on March 17 this year. With temperatures predicted in the low teens this weekend, getting out for a round of Easter golf might be just the ticket. The Meaford Golf Club is right in town, right next to the Meaford Haven retirement community, and offers a twin nine-hole configuration, so you can play 18 holes of golf in two different ways – on the same day if you want! Stone Tree Golf Course, just south of Owen Sound, is also open this weekend, accenting the golf with a delicious Easter brunch on Sunday from 11 a.m. to 2 p.m.. And with “Pay-the-temperature” green fees, the price is right. Pay only $20 plus the temperature for 18 holes, and $10 plus the temp for nine holes. The same deal applies at Legacy Ridge Golf Course, which is the new name for the Owen Sound Golf and Country Club. With sweeping views of Owen Sound Bay, the 91 year-old club has started new life under ownership of Stone Tree. And during April, you’ll pay only $30 plus the high temp for 18 holes, and $20 plus the high temp for nine holes. Cobble Beach, the much-lauded new links-style course north of Owen Sound, opened for the season today. Among other praise, the course has been named one of the top 20 courses in Canada by Links Magazine; Ontario’s Best New Course by Ontario Golf Magazine, and Top 10 Best New Courses in the World by Travel & Leisure Golf. It’s just a half-hour drive. Just a few minutes down the road, the Golf Club at Lora Bay is also open Easter weekend – the earliest opening weekend yet for the course. This weekend, all greens fees are only $59, including power cart and just $39 after 3 p.m. The course has hosted the Telus Skins Game, and the PGA Nationwide Tour Ford Wayne Gretzky Classic. Monterra Golf, at Blue Mountain, is also offering a deal on greens fees – only $49 through the weekend, cart included. Monterra was designed by Tom McBroom and opened in 1989. 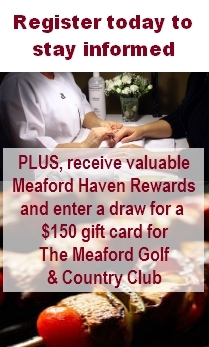 These are just a few of the golf courses you’ll enjoy in your Ontario retirement community at Meaford Haven. So why not start checking them out now?